The Boston Redevelopment Authority is hosting a community meeting to present certain changes to the civic and cultural use program at the Fan Pier Development site. The City of Boston’s long-standing planning objectives for the South Boston Waterfront District include a broad mix of uses tied together with an inviting pedestrian scale including continuous public access along the waterfront on the Harborwalk system. The mix of uses include commercial, residential, hotel, retail, open space and civic development. The waterfront and Harborwalk are to be enriched by parks, overlooks, civic uses and cultural facilities. The call for civic and cultural facilities was underscored through the approval of the South Boston Waterfront Municipal Harbor Plan. 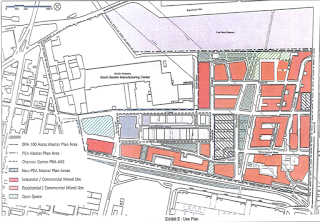 Pursuant to that plan, 127,000 sf of new civic uses along the South Boston waterfront were authorized to balance the scale of new private development along the water’s edge. The assemblage of open space and new civic and cultural facilities are the kind of special public destinations that will help transform the South Boston waterfront into a vibrant and popular year-round public destination. The South Boston waterfront is evolving into a strong civic and cultural district with facilities located both along the water’s edge and within the neighborhood. These destinations include the Artists for Humanity, Midway Artist Studios, Fort Point Artists community, Boston Children’s Museum, Boston Tea Party Museum, Moakley Federal Courthouse, and the Institute of Contemporary Art (“ICA”). The ICA is a standalone symbol of the City’s planning objectives to enhance the edges of Boston Harbor with cultural facilities, bold architecture, public attractions and open space. The ICA has drawn 2 million visitors to the South Boston Waterfront since opening its doors in December 2006. Proposed changes to the civic and cultural use program at the Fan Pier Development site include increasing the total gross square feet of civic and cultural uses from 107,000 square feet to 111,000 square feet, allowing the ICA‘s expansion into adjoining Building I, and consolidating 17,166 square feet into Building D for a program proposed by The Boston Children’s Museum, The New England Aquarium and the Boston Harbor Island’s Alliance.